If you’d never tried a mince pie before you’d think they were a very strange thing to eat, and, although I adore them in all forms and look forward to my first one every year, I’d probably have to agree. Bought mince pies can taste like there’s molten balsamic syrup in them, and homemade often disappoint too for a number of reasons: aside from all of the old recipes that actually included skirt steak, most recipes nowadays still include quite large – and totally unnecessary – quantities of suet, which makes the mince pies heavy, leaden, and somewhat unlovely. But they can be wonderful if they’re made with good quality ingredients and a bit of care. These almond, apple and cranberry mince pies (combining mincemeat from Jamie Oliver and almond pastry from Jenny Bristow) are light, bright and taste properly festive, as they’re full of clean, celebratory flavours like orange, lemon, ginger, cinnamon and brandy. 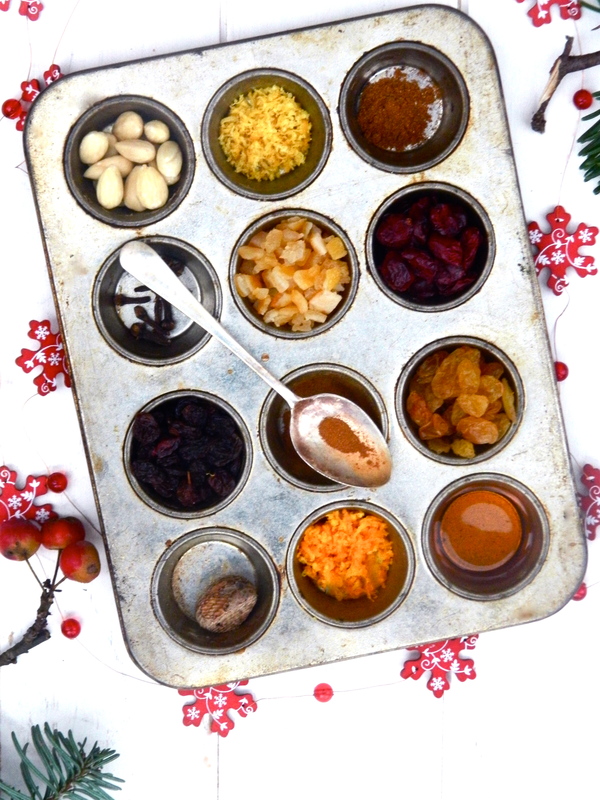 Making your own mincemeat is surprisingly easy – you just put everything into a bowl and cover it – and it feels like a very festive and Nigella-esque thing to do, especially if you have Christmas FM on and people in the kitchen. Or, go the other direction and follow every food writer’s favourite tip and add chopped Bramley apple and lemon zest to bought mincemeat. Also, don’t stress too much about the pastry – if you have time, it’s not as hard as you’d think; if you don’t, bought shortcrust or even puff is fine. From Jamie Oliver. Makes enough for around 16 medium sized mince pies. Put all of the ingredients in a large bowl, stir well to combine and leave for 24 hours (or more!) to allow the flavours to come together. Mix the flour and almonds in a bowl. Cut and rub in the butter, add the sugar and lemon zest. Mix the egg yolk, orange juice (and a touch of milk if needed) to form a soft dough. Knead lightly on a floured surface, then chill for half an hour in the fridge until firm. Preheat the oven to 180ºc. Roll out the pastry on a lightly floured work surface to a depth of about 3mm, and then cut out circles to fit your tin, using a fish slice to lift them off the surface if necessary. Make sure your tin is non-stick; if it’s not, rub a little vegetable oil around each indentation with some kitchen paper. Press each circle into the tin, stopping up any gaps with little bits of excess pastry. 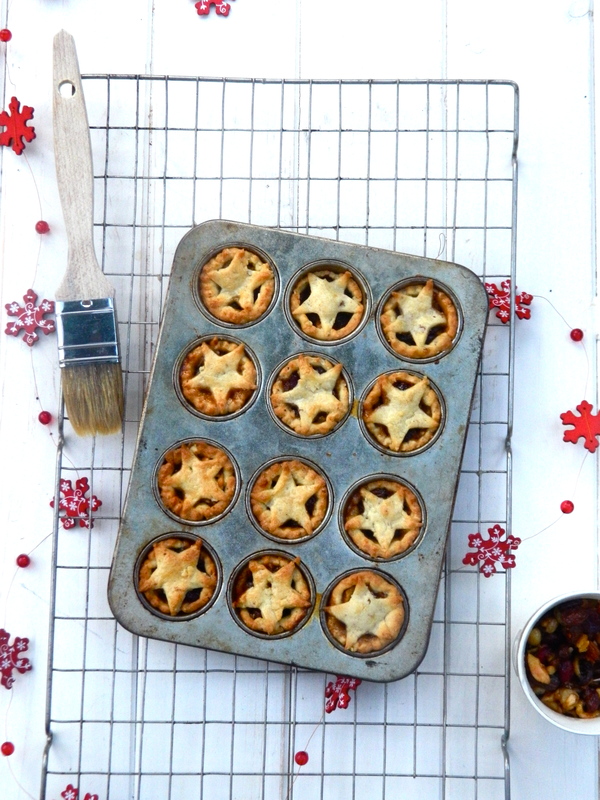 Add a spoonful of mincemeat to the pastry cup (it could be a teaspoon or it could be a dessert spoon – it depends on the size of your mince pies) and cut out a star for the top. Don’t overstuff the pastry cases though, as the liquid will ooze out and burn onto the tin if you do. Beat an egg, and brush any visible bits of pastry with it. Bake the mince pies for about 15-20 minutes, or until they’re golden and smell delicious. Leave them to cool completely in the tin before you attempt to get them out, or they will crumble to the touch. Once the tin is cool to the touch on the bottom, lift them out carefully and set on a cooling rack. Serve either warm or cold.